The Sunnyside Sound Project focuses on the colorful shards, modules, spices and stitches of everyday life in Sunnyside, Queens. For one year, each week I added one resident profile, including sound, photography and writing. On the map, zip code 11104 looks like a Tyrannosaurus Rex with a severed tail. If you had to draw the neighborhood’s borders, your pen would draft along the LIRR track, 43rd Street and Woodside Avenue for the dinosaur’s head; 49th Street, Skillman and Greenpoint Avenues would compose the odd creature’s upright body; and 42nd Street, 51 Avenue and 39th Streets its stumpy legs. Our tyrannosaurus’s little cut-off tail requires a detour to 38th Street. 60 percent of the people who live in Sunnyside were born abroad; 71 percent speak a language other than English at home. In fact, we are more likely to speak Spanish, Creole, Romanian, Korean, Chinese, Armenian, Arabic, Tagalog, German, Italian, Turkish, Polish, Hindi and Begali than English. And when we do speak English, we often have an unintelligible Irish (or German, ahem) accent. We leave for work at all times of the day but one fifth of us crowd the subways and buses between 8 and 8:30 in the morning. Since we live in such close proximity to midtown—the Number 7 trains takes us to Grand Central in less than 15 minutes—half of us make it to work in 34 minutes or less. Our educational levels are as mixed as our ethnicities and incomes. While the majority of Sunnysiders have at least a high school diploma, there are about as many adults with a graduate degree as there are with less than a 9th grade education (10 and 11 percent respectively). 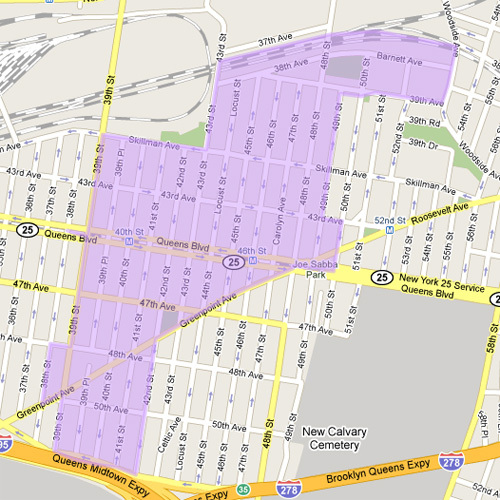 There are households in Sunnyside that live on less than $10,000 annually and households living on more than $200,000. And then there is everything in between. There are 14,708 males and 14,798 females living in Sunnyside – just under 30,000 people altogether. The Sunnyside Sound Project captures some of their stories.